for East Coast member schools. These were the first rank/title promotions outside of Sifu Chun, Jr. dojo in California. The Kenpo/Kempo Lo Kahi Association of America is privileged to have the honor of training and representing the Chow/Chun method of Kenpo/Kenpo. We look forward to many wonderful years to come. 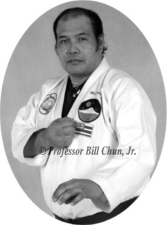 HANSUKI message from Sifu Chun, Jr.